“It’s clearly Fruit Chan’s weakest effort to date, but it’s the only film here that shows any interest in the real word so far”. That was in essence my somewhat defensive appraisal of Public Toilet, published in a report of last year’s disastrous Venice Film Festival. (1) “It’s not for the public, not for the critics, but for himself”, the film’s press agent told me after the screening, whilst I scanned the premises in vain for any colleagues or acquaintances who hadn’t given up early, “that’s why I like it.” I couldn’t help agreeing, still somewhat clueless concerning the 102 puzzling minutes I’d just sat through. In a year when Sokurov’s Russian Ark or Nikolaus Geyrhalter’s Elsewhere achieved cinematic beauty with Digital Video (not to mention Michael Snow, who carved a singular aesthetic out of the medium in *Corpus Callosum), Chan seemed to have embarked on a mission to prove the DV detractors right – Public Toilet looks, a few bold experiments notwithstanding, shoddy, messy, ugly, patched together, whatever you name it, like something you’d just found on the floor and, moved by curiosity, want to pick up, though not with anything smaller in size than a ten-foot-pole. After all, it might still be alive. Furthermore, the film is all over the map, literally – from HK to Korea to China to India to New York and back (2). In fact, though I’ve attempted to piece together something resembling a coherent narrative of the film’s plot, from four pages of (suitably unreadable) notes I’d made, I barely managed to get a grip on the various locales Public Toilet drifts in and out of with no (at least on first viewing) discernible rhyme or reason, much less an idea of narrative or thematic progression. In fact the latter is a not too unfamiliar feeling concerning Fruit Chan’s oeuvre, but it tends to be overshadowed by the infectious, rambunctious energy of his vision, something that works half of the time in Public Toilet. Perhaps this has something to do with the globe-hopping throughout the film; a comparable loss of energy occurs in Chan’s earlier Durian, Durian (2000) after the action shifts to the mainland, though this seems to be the point. His films don’t stay with you as a whole, rather what remains are a handful of outrageous images, disorientingly intimate observations and jaw-dropping set-pieces. Attached to these threads is a nebulous, seductive entity, an overwhelming sense of instantly processed reality, as promising, irritating and aimless as reality itself. Defiantly termite-art in conception, there’s no great unifying theme in Chan’s films, only the unmitigated surge of the struggle to survive. Like a ’70s Altman work stripped of artifice, his movies are nervous, edgy, uneasy, polyphonic, but they rarely take the time to show off their creator’s undeniable skill, they’re much too busy registering a world-in-turmoil, constantly pushed forward by their protagonist’s desires (which often remain unconscious). Yet though Chan’s movies do not have a theme per se, they are eminently and obviously political: it’s the precise portrayal of the protagonists at a particular point in time and space that gives the films their polemical pull. His characters and situations never feel like they were developed with a particular, clear-cut message in mind. That sounds rather nihilistic and to a certain degree it’s unfair – for all his unflinching obsession with death and angst, there are at least as many moments of human compassion and romantic beauty scattered throughout Chan’s work. Actually, most of the narrative progression in Public Toilet stems from the search for miracle cures for ailing or dying friends and relatives, which usually connect with the titular location (“It’s popular to drink urine right now”, a doctor bolsters his not-so-miraculous recommendation). Which, in turn, represents the other thing that connects the bits and pieces of storyline: the irresistible proposal of a unifying “toilet culture” all over the world. After all, we’re all the same when taking a crap. It can’t count as a surprise then, that Chan’s scatological focus is on urinals everywhere (4). 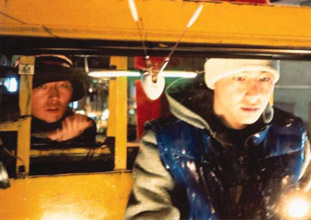 Admittedly, scatological obsessions are nothing new in Chan’s body of work, but they’re not as extensively highlighted as they are in Public Toilet, which may go toward explaining the less-than-enthusiastic response the film elicited from my colleagues and most of the audience, judging from the constant walk-outs. In Public Toilet, the urinal is the place where birth and death takes place, enlightenment and disillusion occur. That this happens in a public space, not a privileged one, heightens the film’s democratic tendencies and the same spirit seems to inspire its structure: none of the various storylines is privileged, which gives Public Toilet its maddeningly complex/unfocused form. That there are at least as many scenes that seem to go nowhere as those that actually manage to pack a punch, only enforces the point: Public Toilet is something of a travelogue which generates an all-encompassing curiosity that is so overwhelming it would be sacrilege for one to filter out the “weaker” parts of the film (5). That curiosity is also the reason I can’t dismiss Public Toilet out of hand despite its obvious flaws and way too many open loops. It defines the in-the-moment-attitude that gives Chan’s films their human frailty, a startlingly frank expression of tenderness towards their conflicted protagonists that prevails over all the harsh plot turns they’re being subjected to, even if Public Toilet seems less bent on examining those conflicts than with just hanging around in the vicinity of its characters. It’s a humble gesture of respect for their existence, and it fits in nicely with what is probably the “theme” of the movie. As Shelly Kraicer has noted persuasively in these pages, Public Toilet deals with Hong Kong’s identity crisis in the face of globalization, proposing the construction of a new identity for a multicultural society. Its equal treatment of the various places and multi-national characters may be erratic, yet it is honest. (“He didn’t want to be an Italian who doesn’t know Italian history”, is the explanation when an upcoming emigrant leaves his friends to study.) There’s a modesty to Public Toilet that makes me hope it’s the future of global filmmaking. If there is such a thing as global filmmaking. You tell me. Sure, there was Far from Heaven, Vendredi soir, Dolls, Depardon’s Un homme sans l’occident, Oasis and the Godard segment of Ten Minutes Older: The Cello. Unfortunately, however, a huge percentage of the rest of the program was comprised of works I wouldn’t wish upon my worst enemies. There’s even a POV-shot from the vantage point of a moving toilet (don’t ask), a nice rhyme with the shot down the flushing toilet in The Longest Summer. “Weaker” used shakily in reference to dramatic arc or sheer impact; if you’ve read this far, it should be clear that neither of those is amongst Public Toilet‘s preoccupations, however. Christoph Huber is a Curator in the Program Department of the Austrian Film Museum, where he co-conceived several large retrospectives. He has a Degree as DI of Physics at the Technical University of Vienna, and was a film critic and arts editor for Die Presse from 1999-2014. He is the European editor of the Canadian film magazine Cinema Scope, and a contributor to many international magazines and websites. He is co-author (with Olaf Möller) of books about Peter Kern and Dominik Graf.